Oneta Mary (Blasingame) Russell of North Little Rock left this earth on July 11, 2018, and went home to be with the Lord and join her husband of 59 years, Chester. She was born in El Paso, Arkansas, on October 15, 1920, to the late Jim and Nettie (Vanpelt) Blasingame. 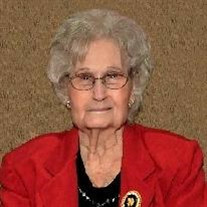 Oneta is survived by two sons; Gail (Caryol) Russell and Larry (Glyneva) Russell, four grandchildren; Robby Russell, and Lisa (Jeff) Menard; Kevin (Debbie) Russell, Alicia (Chris) Krou, and four great-grandchildren, (Kaitlyn, Olivia, Chad and Tyler); one great-great-granddaughter, Saphira; eight step-great-grandchildren; several nieces, nephews, and other extended family that she loved, and they loved her in return. Oneta was a loving, attentive and devoted Christian, wife, mother and grandmother, and entirely committed to God and her family. As a working and stay-at-home mom, (she grew up picking cotton, gardening, canning and shelling tons of purple hull peas.) She kept busy raising her two boys, attending church, grandkids' functions, and making perfect Sunday dinners. She gave her time and love to her husband, children, grandchildren, and great-grandchildren. She was the keeper of our family, was dearly loved and will be sorely missed. The family is especially thankful to her tender caregivers and to the incredible love shown to her by her devoted daughter-in-law, Glyneva. Visitation will be on Monday, July 16, 2018, from 9:00 am to 10:00 am, at Smith-North Little Rock Funeral Home and service will follow at 10:00 am. Graveside at Rest Hills Memorial Park immediately following the service.